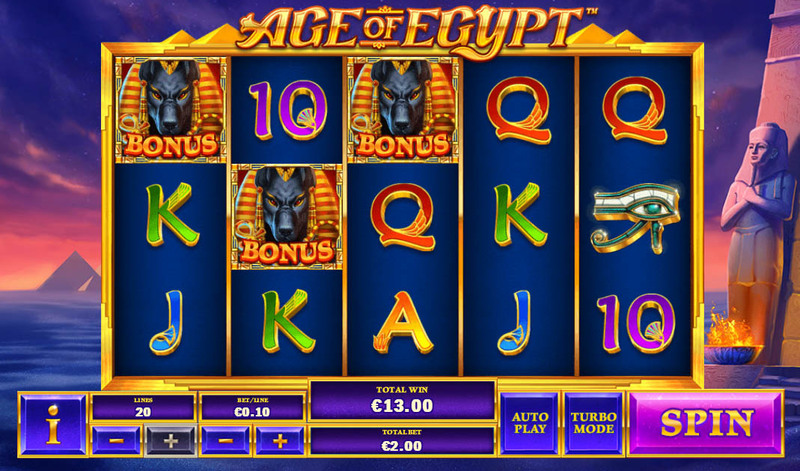 Age of Egypt is a Playtech Video Slot themed around the ancient Egyptian era. 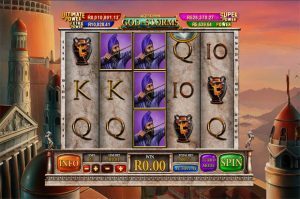 To set the right mood the music has a typical Arabic feel and the pyramids in the background set the ambiance for the treasure wielding, exciting online slot. For South African players wanting to play this slot in Rands we recommend you visit either Omni Casino or Fly Casino. Software: Just take a look at the layout of the five reels which are set in the most beautiful backdrop with a blue setting overlooking the River Nile. You could spend hours playing this slot while happily searching for the hidden treasures. Age of Egypt is all about securing wilds and scatters. Two wilds on a single payline produces a minimum of ten bonus gold coins while five-of-a-kind wilds gives you an awesome 10,000 coins. 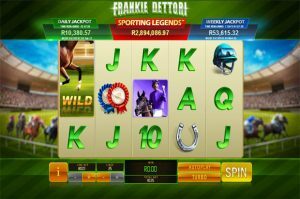 In between trying to produce as many wild spins as possible the next best thing to land is three scatter symbols which provides a Free Spins bonus feature with an unlimited number of spins if you keep discovering scatters during the bonus round. The Anubis symbol is the bonus symbol in the fantastic video slot. To get the bonus games to trigger the Anubis symbol must appear on reels 1,2 and 3. This will then allow you the option to select and reveal artefacts that produce cash prizes. The number of picks you get (either 3,4 or 5) is directly proportionate to the number of bonus symbols that triggered the feature. The Sphinx is the Wild symbol and will substitute all other symbols other than the scatter and bonus wild symbols. Land 2,3,4, or max 5 wild Sphinx’s to get anything from half, 10, 100 or max 500 times your stake. The Pharaoh Queen is the Scatter symbol and triggers the Royal Treasury Free Games feature. 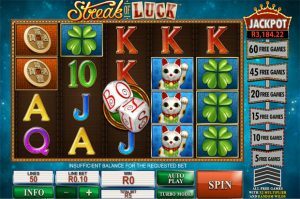 Hit this and you will be given 10 Free Spins with a 3X multiplier. The main aim here is to land more scatters while in the Free Spins mode. 3 or more scatter gives you another 10 free spins. You can keep this going forever if you’re landing 3 or more scatters. Remember, you can also still trigger the Anubis bonus feature in your free spins rounds. 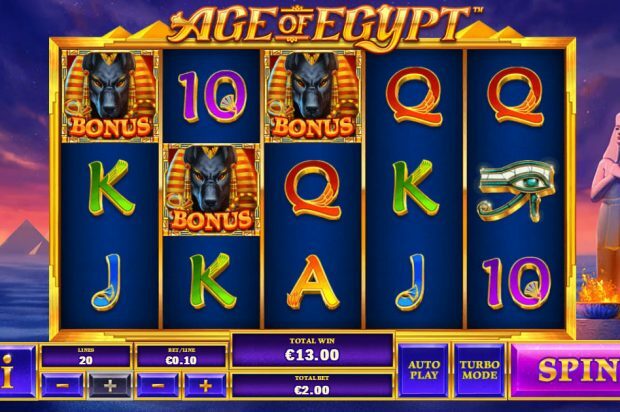 Age of Egypt is an easy video slot to play and it offers a great theme with a fabulous bonus round option. For me, the amazing free spins feature is worth perusing especially if you can keep the scatters rolling in. The treble multiplier makes this a firm favourite in my books.